Martin Shkreli’s notoriety isn’t due to the fact that Turing Pharmaceuticals raised the price of a drug by 5,500%. At least not entirely. That, along with his antagonistic behavior on Twitter — not to mention his gloating over his purchase of a one-of-a-kind Wu Tang album — inspired the public reaction to him more than the price increase itself. After all, raising the price of drugs to whatever cost the market will bear is perfectly legal in the US (Shkreli’s arrest on charges of fraud was unrelated). In the US, unlike in every other developed nation, we let pharma companies set their own drug prices. It’s not even legal for Medicare (the largest insurer in the US) to negotiate drug prices with companies. Shkreli took advantage of that system, but he’s not the only one. Now the Centers for Medicare and Medicaid Services have created a new database that shows exactly what Medicare pays for certain drugs and how much those prices have increased over the past year. You can view and sort the database at this link. The data shows what Medicare spent on drugs in 2014, so it doesn’t include Shkreli’s price increase on the Toxoplasmosis drug Draprim. Nor does it include the heart drugs that Valeant Pharmaceuticals raised in price by 525% and 212% this year. Those same heart drugs had their prices quintupled before the aforementioned increases by Marathon Pharmaceuticals when that company first bought them, before selling them to Valeant, according to the New York Times. 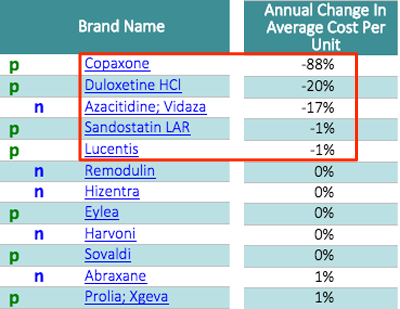 But you can see that from 2013 to 2014, only five of the 80 drugs on the list decreased in price. 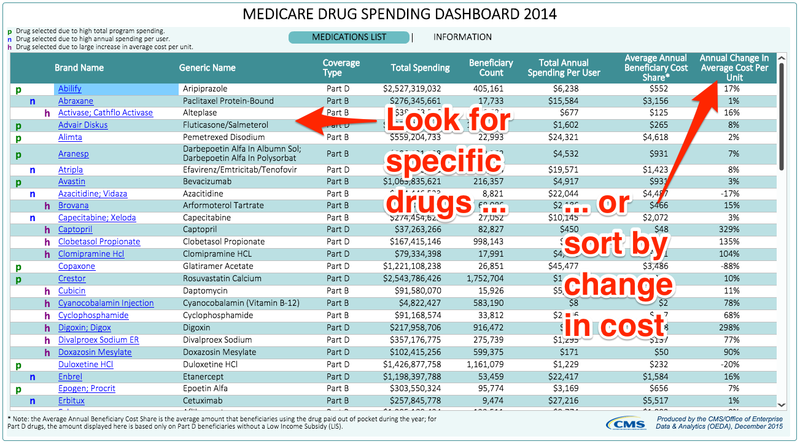 The 80 drugs on the list were chosen because they either ranked in the top 15 drugs of Medicare program spending (under Part B or D of Medicare); they were associated with more than $10,000 annual spending per user and were one of the top costs to Medicare; or they were ranked in the top ten drugs with cost increases. Twelve drugs on the list had price increases of more than 50%. CMSThe top three drugs saw particularly large price increases. 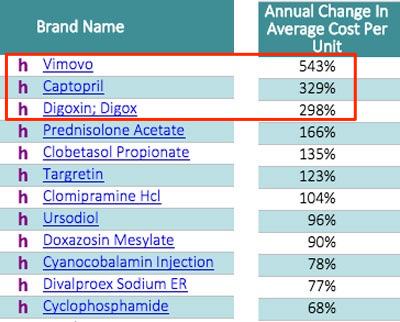 The three biggest price increases were for the painkiller Vimovo, which went up by 543%; the heart and blood pressure drug Captopril, which increased 329%; and the heart drug Digoxin, which increased 298%. While those percentage increases pale compared to Shreli’s 5,500% price bump, they show that the problem is bigger than one person or company. Changing that would require changing the laws we use to set drug prices.